Newspaper article about the Seminole High School reunion held on June 1, 1991. The reunion was held at Sanford Middle School, which was the former building for the high school at 1700 French Avenue in Sanford, Florida. 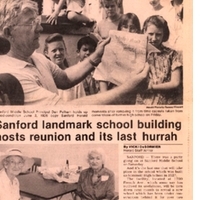 Original newspaper article by Vicki DeSormier: "Sanford Landmark School Building Hosts Reunion and its Last Hurrah." The Sanford Herald, June 2, 1991, pages 1A and 5A: Private Collection of Walter Smith. Original newspaper article by Vicki DeSormier: "Sanford Landmark School Building Hosts Reunion and its Last Hurrah." The Sanford Herald, June 2, 1991, pages 1A and 5A. Digital reproduction of original newspaper article by Vicki DeSormier: "Sanford Landmark School Building Hosts Reunion and its Last Hurrah." The Sanford Herald, June 2, 1991, pages 1A and 5A. Originally created by Vicki DeSormier and published by The Sanford Herald. Sanford Middle School Principal Dan Pelham holds up good-condition June 2, 1926 copy Sanford Herald moments after removing it from time capsule taken from cornerstone of former high school on Friday. SANFORD--There was a party going on at Sanford Middle School on Saturday. And it's the last one that will take place in the school which was built as Seminole high School in 1927. The facility, located at 1700 French Ave., which some say has outlived its usefulness, will be torn down next month to reveal a new school which has been under construction behind it for over two years. "There are a lot of good memories in this old place," said Roy Wright, who was president of the class of 1936 and quarterbaclk of the Celery Feds football team in those days. "But I think the old building has outlived its usefulness and the new buildings will hold some new memories for people." Those who came to reminisce with old friends and to say goodbye to the school of their memories had the chance to walk down Memory Lane where old annuals, photos and newspapers were encased in a glass enclosure. Many of the items in the display had been removed from a time capsule that was removed from the cornerstone of the old building on Friday. Issues of the "Sanford Herald" and the "Sanford Morning signal" from June 1926 were on display. An issue of the "Celery Fed" school newspaper from the 1950s was also shown. "Oh I wish we could take those out and look at them," said Jane Thornton of Deltona, who didn't want to say what year she graduated. '"I want to try on that helmet," chimed in her husband Dave who did not graduate from the school, but said he was interested in seeing the school that his wife had talked so much about. "She talks about this place all the time," he said. "I just had to see it for myself." In the new school cafeteria, more than 500 people from the classes of 1927 through 1960 gathered at long tables festooned with bright stalks of celery and orange and black balloons to eat a spaghetti dinner prepared by the lunchroom staff. The school's jazz band entertained. Small piece's of the gymnasium's wooden floor were on sale for three dollars apiece. Many alumni were buying the mementos. Elizabeth Shoemaker Lynch, who lives in Sanford, was a member of the class of 1927, was also a math teacher at he school in the 1930s and 1940s. "I've seen a lot of my old students here today, but they all looked so much older," she laughed. Margaret Sprout Green, another member of the class of 1927, was unhappy about the impending destruction of a piece of Seminole County history. "It should be preserved," she said. The Celery Feds concluded the day-long reunion with a dance at the Sanford Chamber of Commerce. The Banana Boys (music with appeal, they said), who played at all the school's dances in the 1940s and early 1950s provided the music. DeSormier, Vicki. “Sanford Landmark School Building Hosts Reunion and its Last Hurrah.” RICHES of Central Florida accessed April 21, 2019, https://richesmi.cah.ucf.edu/omeka/items/show/1561.